The eye doctor says I don't need much change, floaters are kind of normal, nothing is detached like a retina, for instance.I do see real interesting lights at night from my "floaters". Doc says these are often precursors to Migraines. I told him, in winter I see sparkly stuff, like oh..air or something...not snow. I have about one headache a year.Yes, he sees this teeny tiny glaucoma speck.. 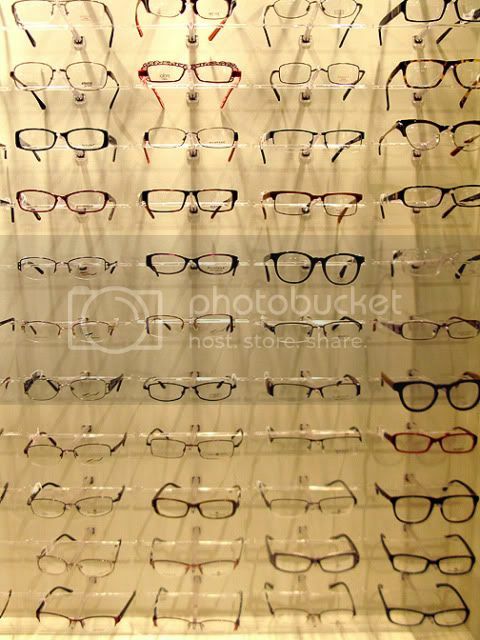 But Sheeze.. what a wall of frames to choose from! I think Diane Keaton chooses the best glasses frames. I admire her choices every time. This time I chose something vaguely purple.